Dekton countertops are sophisticated blend of the raw materials used to produce the very latest in glass and porcelain as well as the highest quality quartz work surfaces. Electronic microscopy allows Cosentino to fully appreciate the material’s zero porosity, a consequence of the sinterization and ultra-compaction process exclusive to Dekton. This zero porosity and lack of the micro-defects that cause tension or weak spots mark the difference as far as Dekton is concerned. Dekton countertop is highly resistant to ultraviolet (UV) light and will not fade or degrade over time making it perfect for both indoor and outdoor applications. Cosentino specifies Dekton as the most scratch resistant surface on the market and while the slip of a knife won’t damage Dekton surface, cutting boards are still recommended to protect your household utensils. Dekton withstands high temperatures without burning, scorching or cracking. Hot Pots and Appliances like Crock Pots can be placed directly on the surface with no worry of damage. Dekton’s finish will last for the life of the product and never needs to be re-surfaced or re-finished. With over 5 times the flexural strength of granite, Dekton countertops can be installed in thinner material over greater spans allowing for up to a 12-inch unsupported overhang on countertops, islands and bar tops. Dekton’s high compressive strength makes it an ideal material for walkways, pavers or driveways. Dekton is non-porous and never needs to be sealed. It naturally prevents liquids and gasses from penetrating the surface, making it a low maintenance surface that is easier to clean. The manufacturing process used to make Dekton allow Cosentino to control the pigmentation and decoration of the material giving better color consistency from slab to slab and resulting in a long lasting product that will not fade over time. The surface you install today will maintain the same new appearance for the life of the product. Dekton is very consistent in both dimension and thickness throughout slab which minimizes the need for field corrections and allows for easy installation. Ultra-compaction is responsible for the material's mechanical properties. This level of compaction contributes significantly to the material's low porosity, making it a low-maintenance, long-life product. 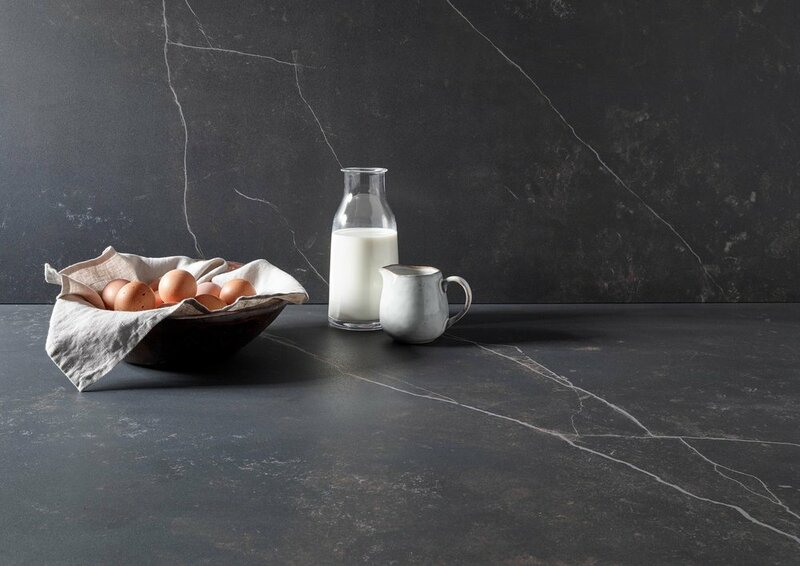 Everything to do with Dekton is extraordinary.